Gidion’s Knot is a hard play to take. As seen in director Jon Tracy’s brutally effective Bay Area premiere staging at Aurora Theatre Company, Johnna Adams’s drama is 75 minutes of nonstop tension, alleviated only by moments of grim humor. Stacy Ross and Jamie J. Jones in Gidion’s Knot. Photo by David Allen. There are just two people on the stage—a fifth grade teacher and the mother who’s been called in for a conference to find out why her son was suspended. Something’s happened in the meantime that makes it a shock for the teacher that the mother even kept the appointment. They’re both very, very nervous and unsettled in different ways, and they’re waiting for the principal to join them. As the cast list can tell you, they’ll be waiting for a long time. Nina Ball’s exquisitely detailed set instantly transports you to a grade school classroom, full of colorful educational posters and a whiteboard reminder to consider, “Is It: True, Helpful, Inspiring, Necessary, Kind.” There’s even a low institutional paneled ceiling with built-in fluorescent lights. Jamie J. Jones is brimming with barely contained hostility as the mother, Corryn Fell. She keeps reining it in to make friendly chitchat, but it keeps coming out in passive-aggressive barbs, and she’s all the more agitated because she still doesn’t know what her son did that was supposedly so bad. 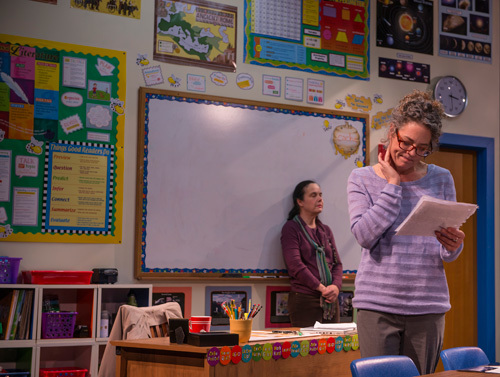 Stacy Ross is a wonder of excruciating restraint as the teacher, Ms. Clark. She’s relatively new at this job, but she clearly has the temperament for it. Things get to her, certainly, but she maintains her equanimity and empathy amid the most gut-punching of Corryn’s accusations. This is palpably difficult for both of them, and that makes it both hard to watch and impossible to look away. Sometimes the tension is so sharp that you don’t even want to breathe. Cliff Caruthers’s sound design subtly accentuates that unease with an almost imperceptible background drone. Much as in Rajiv Joseph’s Glickman Award-winning play The North Pool that TheatreWorks premiered in 2011—which dealt with a high school student being called into a vice-principal’s office for similarly undisclosed reasons—we very, very slowly learn the things that each character knows that the other doesn’t (although in this case it’s almost all things the teacher knows that the mother doesn’t) and also the things they both know that they just find too difficult to talk about. Adams’s dialogue is sharp as a dagger and wielded just as mercilessly. At times the script feels stacked against the mother, who knows insultingly little about her own son, but there are moments too when the teacher’s gentle primness is turned against her devastatingly. And there are plenty of moments of connection and compassion, too. Some of the revelations are more believable than others, and some seem blown out of proportion, but that also seems to be in part the point. And the agonizing, sometimes repetitive veering between denial, anger, acceptance and back again feels very true to the way people cope with unbearable grief. Show #15 of 2014, attended February 9.